What motivated me to explore the chemical world of cleaning? This guy’s armpits may not smell without regular cleaning, but mine sure do! Is it possible to have nice smelling armpits without lathering up some soap in the shower? Can we permanently get rid of those traditional cleaning chemicals that almost everyone has under their kitchen sinks? I began pondering these and many other questions when my wife, Gwen, received a simple pink cloth as a gift from my mother-in-law, CP. 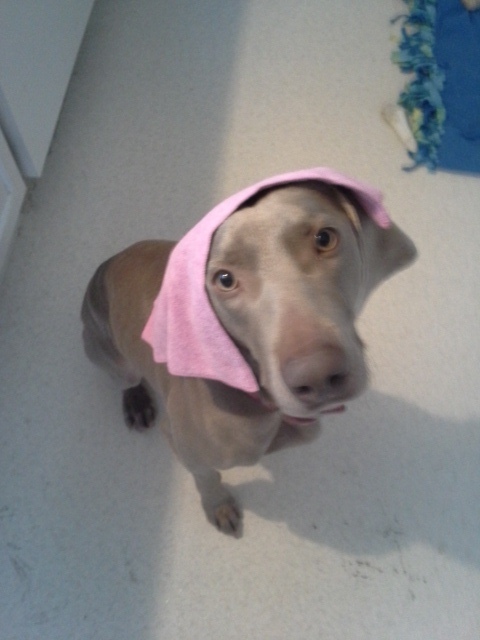 The cloth that shook the foundation of my cleaning world, as modeled by my mischievous pooch, Bristol. Looking more closely, I noticed that many of their products contain silver particles. Silver nanoparticles are being incorporated into a wide variety of consumer products due to silver’s antimicrobial properties. It seemed all too perfect considering I was just starting my Ph.D. research in the Center for Sustainable Nanotechnology. The company never explicitly states that these are silver nanoparticles; they actually use the term “microsilver” to describe the silver contained in some of their products. So, let me just answer one question unequivocally right here, silver itself is a chemical, as is the pink cloth, and even water. All matter is comprised of chemicals. So, unless someone has discovered a way to clean our bodies without matter, there is most definitely no way to clean without chemicals. What would we put in the space under our kitchen sink if we didn’t need cleaning chemicals?? The pink cloth started me thinking about living my life without all these cleaning chemicals, and the risks posed to human health and the environment as a result of their use. I don’t mean to imply here that all cleaning products are inherently bad, but no product is without its risks. So let’s explore. Many people remember the infamous Mr. Yuk. I have great memories as a child of bringing home a book of Mr. Yuk stickers and pasting them all over my parents’ cleaning chemicals under the kitchen sink. I thought Mr. Yuk was fun, but it turns out he has a greater purpose, as exposure to cleaning substances was the cause of over 190,000 calls to the US Poison Control Centers in 2012 . Exposure can include accidental ingestion, inhalation, or bodily contact that induces a negative response. This negative response can be anything from a mildly upset stomach, rash, or headache all the way to death. According to data from Washington State posted on the Environmental Protection Agency (EPA) website, 6% of janitors experience a job-related injury from exposure to chemicals in cleaning products each year. These products contain a variety of acids, bases, detergents, and solvents that can be toxic to humans and pets. 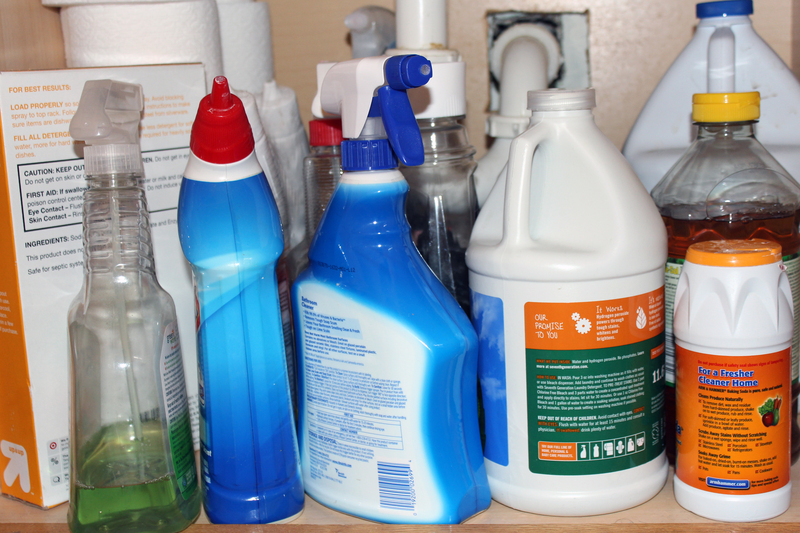 Besides direct hazards to human and animal health, cleaning products can also pose more broad environmental threats. According to the Norwex website, over 14,000 TONS of household chemicals are released into the environment each and every day. This release could be into the air as these products evaporate, into the soil, or into the wastewater supply. While I could not find a government figure to back-up the number cited by Norwex, I was able to see that Proctor and Gamble sold over $26 BILLION in fabric and home care products globally in 2013. No matter where we get our numbers, it is clear that large amounts of cleaning chemicals are used worldwide. The good news is the majority of these chemicals are broken down and rendered harmless through reactions in the air and soil and through engineered wastewater treatment processes. Unfortunately the phrase I used was “the majority,” but not “all.” Some of these chemicals are known as persistent in the environment, meaning they do not easily degrade. When they do not degrade they can start to accumulate and concentrate in living organisms (see Laura Olenick’s post). Additionally, phosphate-containing soaps may be one (of several) causes of the eutrophication observed in many U.S. water bodies. 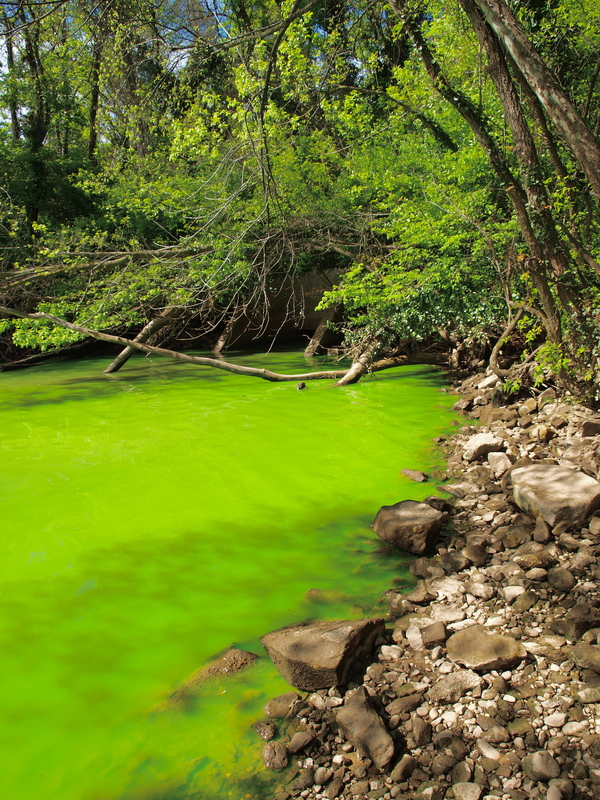 One example of eutrophication is a “bloom” of algae in a lake or pond. Algal blooms can have serious negative impacts on aquatic ecosystems (see picture below). One example of an environmentally persistent chemical is triclosan, which is found in products from hand soap to toothpaste (check your labels at home!) due to its antimicrobial properties. Triclosan is the active antimicrobial ingredient in many products, but some are concerned with its use. This chemical can already be found in many U.S. streams and inside many humans. The EPA states that triclosan has the potential to accumulate in living organisms. Many researchers around the world are studying triclosan to understand what its long-term impact on the environment and organisms may be. There is currently evidence that triclosan can negatively impact sea urchin reproduction, and research with other organisms is likely to follow. Many individuals and groups have begun to speak out against the use of triclosan in products. Cleaning supplies are obviously useful, but should we start looking into alternatives? Maybe the pink cloth can move us away from traditional cleaning chemical use, but should we be concerned about the silver it contains? There are trade-offs with every sustainability related decision, so I can’t provide a simple answer here. With approximately 2,000 new chemicals introduced in the U.S. for various purposes each year, it would seem likely that some may be toxic and/or persistent. As more people become concerned with sustainability issues, the business of “green” chemicals has grown dramatically. Even the EPA has a guide for purchasing greener cleaning products aimed at federal purchasers. Like many sustainability issues, the topic of cleaning chemicals is very complicated, and it is difficult to determine which solution is the best option for both humans and the environment. Silver is an interesting beast of an anti-microbial. Chunks of elemental silver are just as good at killing unwanted bugs as finely milled nanosilver. However, the size of the particles is what makes it good at touching and killing a large volume of microbes. The mechanism is a slow release of silver as it ionizes and solvates. Therefore, the increased surface area of nanosilver particles is critical. As a result, we increasingly find silver in all kinds of things, many of which you’ve reviewed here. Silver powders have been used for nearly 100 years as a “cure all”. It was not an uncommon practice to just mix it right in with the morning coffee (do not try this, silver should only be used topically and virtually zero oral bioavailability). This kind of self-medication led to the discovery of only one known untoward side-effect, argyria. This is a discoloration of the epithelium everywhere in the body where epithelium can be found due to a powerfully insoluble complex that ionized silver form with free chlorides. The side effects are purely aesthetic, which suggests that silver is very safe for human use. What is less well known is if the destabilizing effect silver has on microbial membranes also impacts microbes in our soil and aquatic systems to any significant extent. Other metals with similar mechanisms of antimicrobial action such as nanoparticulate gold do show some significant impacts on ecological systems. As much as I love silver as a highly effective topical antimicrobial compound for critical care situations such as wounds and burns, I’m hesitant to praise the use of silver in the household in the same way we use triclosan. My professional opinion is that I just don’t think we need or even want to be that clean in the home. Pits provide a different problem though. It’s one thing to be a tree hugger. It’s another thing entirely to be a smelly hippy. Smelly pits are gross, and no amount of my own environmentalism will change my mind about that. I’m still trying to find out if aluminum chlorohydrate is really that bad, and ultimately if the anti-perspirant crystals of alum (aluminum phosphate or other varieties) are really any better. Kyle is stealing my thunder for a future post! 🙂 Excellent comment, Kyle. I will elaborate even further in the future. I would be interested in knowing a good “non-chemical” way to remove baked on olive oil from pans. I like vinegar as a cleaning product, too. Any comments to help would be appreciated. Thanks for doing this Eric! Jared, it has been a long time! Thanks for the post. I agree with you on vinegar. It, along with baking soda, are two of my favorite cleaning standbys. Please also look at the post by Kyle Kleinbeck below, which includes a list of more sustainable cleaning products. I like to imagine that Garrison and I are buds, but I think the relationship is mostly one-sided. I was certainly going to search the literature, and provide a list of ingredients of concern for another blog post. I definitely hope to hear feedback from several people, which I am planning to use to use to guide my future related posts. I hope you are enjoying the day off! Michael Braungart, a chemist, and his partner in ecologically conscious product design, William McDonough, are the brainchildren behind the book and product ratings institute, Cradle to Cradle (they also wrote the considerably more upbeat and fun follow-on, The Upcycle, which is one of my favorite books ever). The Cradle to Cradle Products Innovation Institute seeks to identify products which fully compostable or which have a robust system to completely reuse or recycle every non-compostable component. Their products registry includes a list of cleaning products here http://www.c2ccertified.org/products/registry .